An epic 52-min documentary and multiple-supports 10x3min series about the preparation of the French athletes to the Olympics! Broadcasted on IMAX (La Géode), on Orange Sport, Orange 3D and the Nintendo 3DS game console. Produced with the help of the New Technologies for Production grant of the CNC (French "Ministry of Cinema"). Directed by: N. Thibault, C.A. Saudinos, C. Sirtori. Commercial-like lighting; Shot on Red EPIC; use of 240fps slow-motion shots; S3D waterproof cameras; heavy use of Parallell-VM's Polarization Killer; innovative grip designed by Visuel Mouvement. "Rodin 3D" is the first episode of a collection of documentaries (3x26min every year) for international channel ARTE. This collection will be produced for a minimum of three years. Produced with the help of the New Technologies for Production grant of the CNC. Next episodes: Brancusi 3D, Donatello 3D. Massive use of Parallell-VM "Polarization Killer". Shot on Canon C300 with Angénieux Optimo DP 16-42mm synchro zooms. "Kings of France 3D", a direct-to- Blu-Ray series targeting the United States market. First european use of the Panasonic AG3D-P1 (monobloc binocular shoulder camera). The reference course, Dimension3 2010 winner. See also page "press". 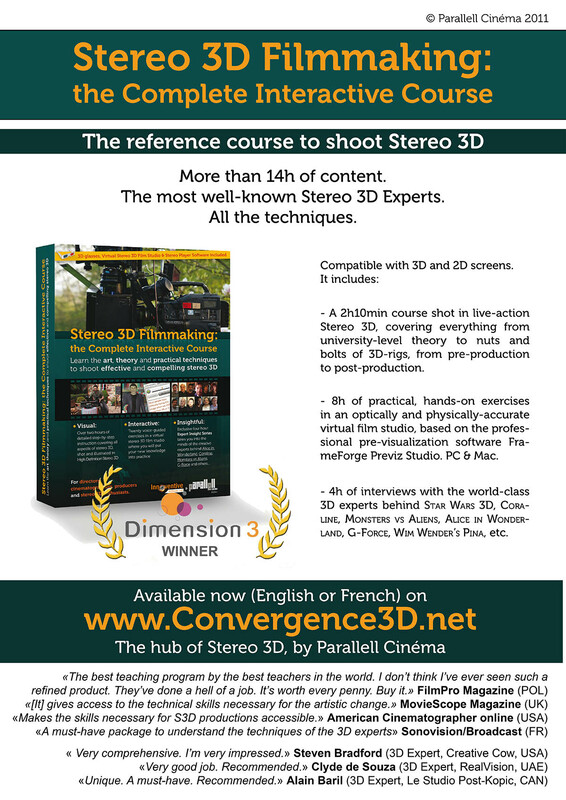 The best and most advanced way to learn how to shoot and produce in S3D. The package includes 14h of content, including 10h in S3D and amazing technical ITWs with world-class experts. Directed by: C.A. Saudinos, D. Steiner, C. Sirtori.